While some roof systems call for less intense maintenance than others, all roofing systems should be checked periodically and maintained accordingly. The Institute for Timber Construction South Africa (ITC-SA) weighs in. As the saying goes, prevention is better than cure, and the best preventative measure one can implement in the care of a roof structure is to conduct regular inspections to help identify and remedy problems as and when they occur. A roof withstands more from the elements than any other component of a building and the frequency of roof inspections and maintenance is dependent on the geographical location of the given building; if the structure is close to the sea or in similarly harsh conditions, it will need greater care than a structure inland, for example. That said, preventative maintenance is pivotal in saving money on a roof by providing a longer service life. When it comes to the roof’s exterior, be sure to check for any cracked roof tiles, loose sheeting and loose roof screws. These may cause leaks, which have the potential to cause damage to the interior timber of the roof structure and prompt or accelerate wood rot. At the same time, look for open areas around newly installed antenna shafts and chimneys; while waterproofing should be installed to prevent any leaks, the condition of the waterproofing membranes must also be inspected regularly. Crumbling chimney mortar could also signal moisture penetration and will need to be reapplied. Timber roof overhangs are most susceptible to the elements and should be maintained regularly to prevent fungal attack or rot from moisture. 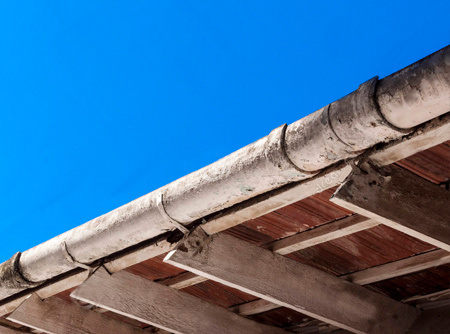 Loose fascia boards and leaking gutters are the most common cause of leaks onto roofing timber. On this note, be alert to any creeper plants growing onto the overhanging roof timbers. Keep all gutters free from debris and make sure the downpipes are draining properly by water testing them. If the roof exterior is beginning to collect moss or algae, consider installing zinc or lead control strips to help control the problem. These strips form harmless zinc oxide when rainwater runs over them, in so doing, carrying with it a coating preventing further moss or algae growth from occurring. Check all flashings, making sure they are not deteriorated and be sure to secure or replace any loose shingles. Trim back any overhanging tree branches and check any metal on the roof for signs of rust. Pay attention to all caulking and sealants, and scrape and remove any caulking that is weathered, cracked or damaged, and reapply. If the roof has gravel surfacing, be alert to any bare spots, otherwise, check for blisters in the roofing material. Salt or dirt build-up can encourage rust on steel roofs, and moss and lichen growth on tiled roofs. Some manufacturers’ warranties advise regular washing, particularly in areas that don’t receive frequent rain. Frequent washing and inspection are advised to prevent salt and dirt build-up. Exposed timber trusses must be treated for exposure to the elements. Cracked timber components in the roof structure are the first warning signs that something within the roof structure is deteriorating. Inspect all the components of the roof structure after new services, like plumbing, electrical and/or a fireplace, are installed. 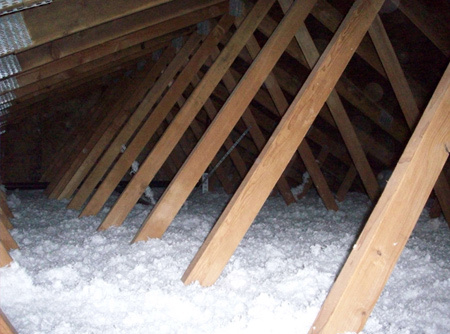 Check the interior of the roof for any leaks; these may be indicative of a leaking roof membrane. If timber is beginning to show signs of rot, painting it will only worsen the situation. In this case, it is advisable to replace the affected timber. Painting and repainting should only be done on healthy timber surfaces. Be sure to adhere to the paint or treatment specifications concerning the application. Additions, such as a cooking canopy that extracts smoke or steam from the kitchen, for example, are usually suspended from the roof trusses. In the case of additional loading, it is important to ensure that the load is spread across more than one truss. The load of the item should be established before installation and the truss design should be checked for any added loads. 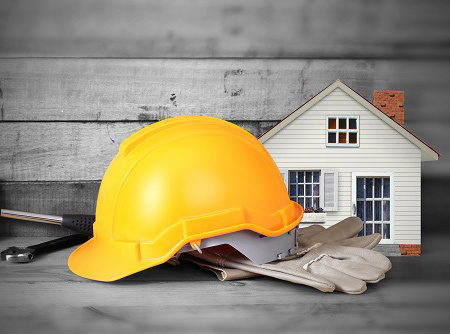 Be sure to use a professional to install new items in roofs, such as additional ceilings, bulkheads and chimneys. Storage in roofs is not recommended unless the design of the roof specifically makes provision for this. d. The records of the inspections and maintenance are kept and made available on request to an inspector. The roof is a structurally important and very costly component of a building and the average cost of a roof as a portion of the final building can easily exceed 25%. The costs associated with repair or replacement of the same roof structure will be even more than this due to the additional work required to establish structural integrity. This is why it is imperative that a roof structure, on residential, commercial and industrial buildings, is regularly inspected for any anomalies and that remedial action is promptly and accordingly taken. A roof is a lifetime investment and should last just as long. All nail-plated timber roof structures must be designed, manufactured, erected and inspected by ITC-SA accredited members who have been awarded a Certificate of Competence. An A19 Certificate will be issued on compliance, which is required by the Local Authority before issuing an occupation certificate. Many thanks to MiTek Industries SA and International Truss Systems for their contribution to this article.